This is a place where the past and the present merge in perfect harmony. Romantic, old Finnish town, perfect to spend a weekend with loveone. Definitely perfect place to spend Christmas! Porvoo is situated about 50 km to the east of Helsinki, at the mouth of the river Porvoo (Porvoonjoki). This idyllic town grew up on the banks of calm and beautifull river in the 14th Century and it is a second oldest town in Finnland. It gives a perfect glimps of what Finland must have looked like few hundreds years ago. 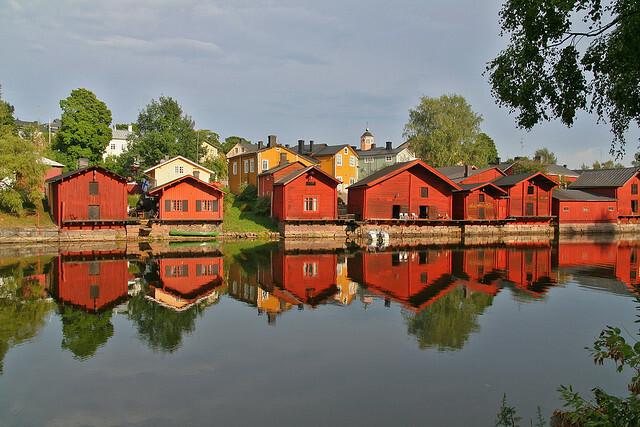 Approaching the ancient town, first glimpse of Porvoo is a pea green river and the reflections of red, green and yellow buildings mirrored on the water's surface. 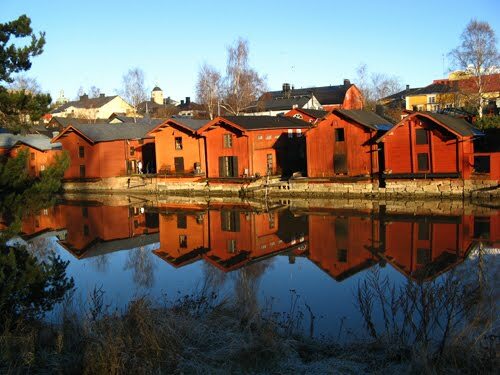 Along the Porvoonjoki (Porvoo's river) are numerous red boat houses that have characterized Porvoo for centuries, and which have been depicted countless times by artists. 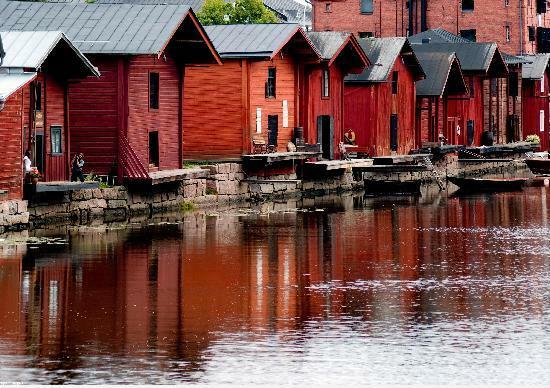 The red color dates from the 18th century when the owners painted the buildings to honor King Gustav III of Sweden. Trade has been carried on for centuries under the black roofs of the red ochre shore houses. . The ships loaded butter, dried fish, timber, tar and flax, among other things, and unloaded exotic delicacies, such as fruits, wines and spices. The shore houses also served as intermediate depots of coffee and tobacco. Today the shore houses overlooking the river are mainly used as private living quarters and storage spaces. No painter's stroke could duplicate the beauty of this spot: the emerald green of trees and shrubs on one side of the Porvoo River; small boats tied to their moorings, bobbing with the slow current. Walking through the small paths and alleys of the Old town you can enjoy in beautifull and authentic finnish architecture - colorful old wooden houses, narrow curvey cobble stone streets, wonderful church up on the hill, great unique small shops and dozens of museums and galleries. The Baroque building sports a clock tower that will fascinate anyone interested in architecture of the period. The imposing salmon-colored building up the hill on Valikatu Street was once the Old Town Hall (1764) but is now the home of the Porvoo Museum. Actually, the Porvoo Museum is composed of two museums and two buildings: the Historical Museum and the Edelfelt-Vallgren Art Museum. The mission of the Historical Museum is to showcase the history and culture of Porvoo and the region through its collection of furniture, textiles, local artists' work, glass, toys and the like which is shown throughout the first floor. The second floor is dedicated to the what life was like in Porvoo during Medieval times. The Edlfelt-Vallgren Museum concentrates soley on the work of two local artists who gained international recognition: Albert Edelfelt (1855-1905), and Ville Vallgren (1855-1940). Albert Edelfelt, one of Finland's most well-known painters of the 19th century is perhaps best known for his portrait of Louis Pasteur, the great microbiologist. His studio, dating from 1883, provides a stellar look at the range of architecture that forms this unusual town. Another popular site is the museum that was once home to Finland's former national poet, J.L. Runeberg. It is Finland's oldest home museum, opened to the public in 1882. The central point of the old town is the medieval, stone and brick Porvoo Cathedral which gave its name to the Porvoo Communion - an inter-church agreement between a number of Anglican and Lutheran denominations.The history of the granite cathedral dates back to the late 13th century. It was rebuilt or repaired several times. During WWII it was even hit by a bomb, but luckily not damaged. Inside the church a nice wooden tall ship can be seen. The interior houses a model of a tall wooden ship that is alone worth the trip. At the beginning of the 19th century, Finland was annexed to Russia as an autonomous grand duchy. Tsar Alexander I convened the first diet in Porvoo in March 1809. In Porvoo Cathedral, he gave a sovereign pledge in which he ratified the country's religion, its constitutional laws and the rights of the estates. Outside, you'll be able to explore the belfry that, unlike similar structures elsewhere, isn't attached to the main building. Arrangements can even be made to get married in the cathedral, though you'll have to plan a couple of years in advance, at least. Brumberg Oy, a small chocolate factory is located in Old Porvoo, next to the cathedral. The production facilities include a small shop where you can buy chocolates and pastries handmade by the master chocolate-maker. A quality chocolate and candy factory with traditions going back all the way to 1871. Free samples of delicious wrapped truffles tempt the tourists. 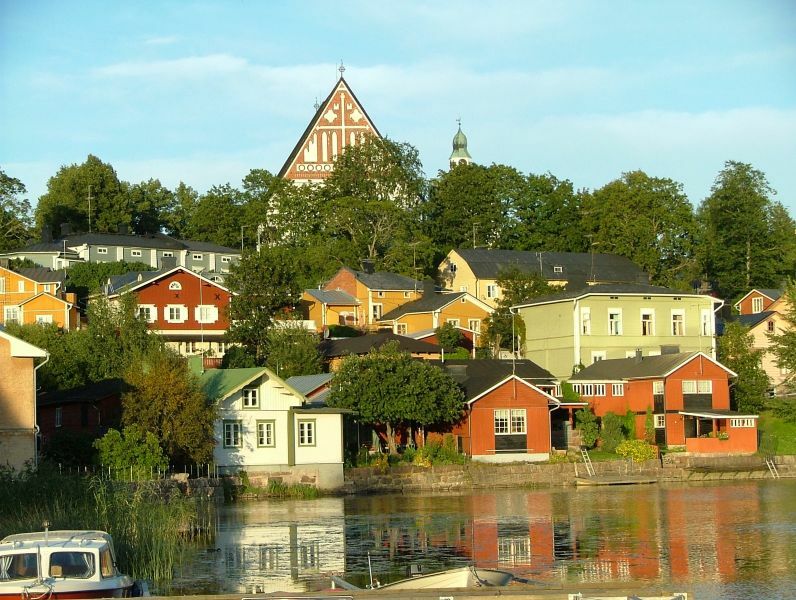 In addition to Old Porvoo and the attractions downtown, travellers should consider a trip to the beautiful archipelago. Alongside the old islander life, there are summerhouse residents and boaters. There the choices include an archipelago cruise, summer markets and outdoor recreation areas as well as outings in the countryside. Also, there are many manors, an animal farm and nature trails. Boating, fishing, sight-seeing, and canoeing are some of the favorite summertime activities here. For those who love golf there is Virvik Manor , an 18-hole golf course located 18 kilometers from downtown Porvoo, far from the rush and noise of the city. The town has a surface area of 1 768 square kilometres, of which 654 is land and 1114 water. 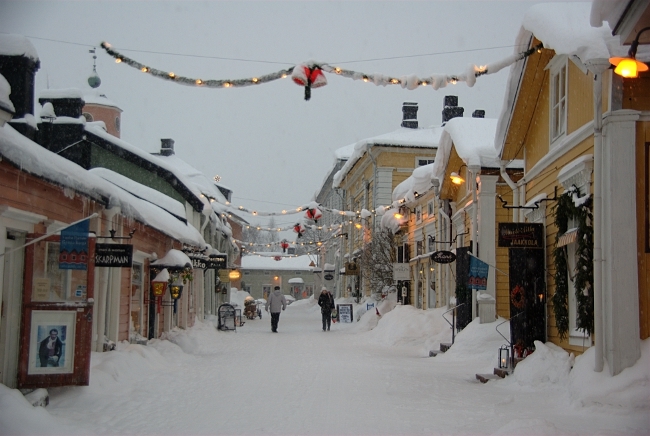 The town's population is over 44 000, of whom 64 per cent are Finnish-speaking, 34 per cent Swedish-speaking and about two per cent others. 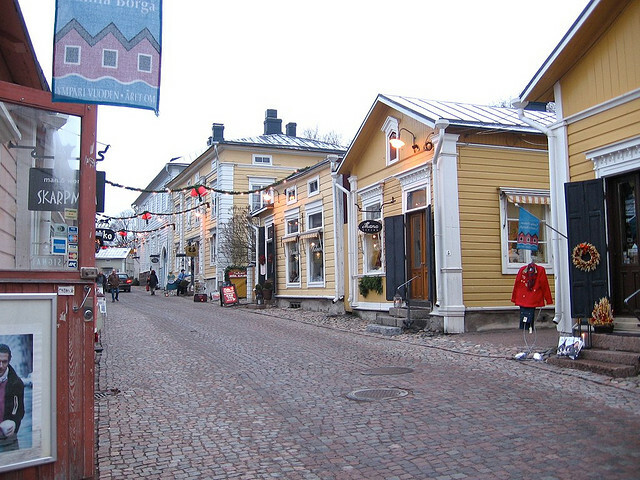 More about what can you do and see when visiting Porvoo you can find here.